Net Promoter Score℠ (NPS®) is an industry standard for measuring customer loyalty. That is, how likely your customers are to recommend your business. You can send an NPS survey, which includes one simple question, to target customers. An overall score is derived from the survey results. For information about viewing your survey results, see Analyzing your NPS survey results. If you find you're having trouble with your NPS survey, see Troubleshooting your Net Promoter Score℠ survey for help. NPS is available as a Professional or Enterprise Add-on. You must be an administrator to send and view NPS surveys. Enterprise agents in a custom role with permission to view reports cannot view NPS results. For an overview of NPS surveys, see About Net Promoter Scores. Note: NPS surveys are part of an Add-on that also includes customer lists. **Net Promoter, NPS, and the NPS-related emoticons are registered trademarks, and Net Promoter Score and Net Promoter System are service marks, of Bain & Company, Inc., Satmetrix Systems, Inc. and Fred Reichheld. You can send one NPS survey at a time. A live survey remains open to collect feedback until you manually close it. You can have only one live survey at a time. You must close a live survey, if there is one, before you can send a new survey. Note: For best practices for creating and sending your NPS survey, see The most effective way to send a Net Promoter Score® survey. Define Recipients You can upload a CSV file or select a customer list to survey. You can invite a maximum number of 10,000 customers. You can invite more customers to the survey later, after you send it. You should either send the survey to all customers or to a random sample (using a tool such as the one from Random.org). For statistically significant results, send the NPS survey to at least 1,700 customers (see Survey the right number of customers). If you choose a customer list, the survey will be sent to a sample of users in the customer list, based on your total number of users. Users who have received a survey in the last 90 days cannot receive an NPS survey, and will be automatically filtered out of your CSV file or customer list. Customize Survey You can review the email that users receive containing the survey and you can review the confirmation page users see after clicking a rating in the email. You can also edit the question, add your logo, and select a custom color. Be sure to send yourself a test email with the survey to see how it looks. You can send an NPS survey in multiple languages (see Sending your survey in the user's language). Click the Reporting icon ( ) in the sidebar, then click the Net Promoter Score tab. If you have not sent an NPS survey before, look for Send new survey instead. Note: If you currently have a live survey open, you must close that survey before you can send a new survey (see Closing an NPS survey). At the top of the page, click the survey name and enter the title you want to give to the survey. In the Define Recipients section, use one of the two options to select your survey recipients. Note: Alternatively, you can use the API to automatically send surveys after an event occurs in your product or service. You'll need the unique survey ID to do so. See our NPS API documentation. You should send the survey to all customers or to a randomized sample of customers. The maximum number of customers you can invite to the survey to at one time is 10,000. You can invite more users later, after you send the survey. Ineligible users will be automatically filtered out. Ineligible users include agents, users who received a survey in the last three months, and users who marked a previous survey as spam or unsubscribed. Select a customer list. You can select an existing customer list. To create a customer list, see Creating and using customer lists. Surveys will be sent to a sample of users in the customer list, not all users in the list. The survey will be sent in the language on each user's profile in Zendesk Support. Upload a file. You can upload a CSV or an Excel file. Download the template to ensure your file is formatted properly. The file cannot contain spaces and must be delimited correctly. You can include users who are not in Zendesk Support, and they will be added as new users. You can specify the language of your users in the file, and the survey will be sent in their language. Customize your survey as needed. Send a test survey if needed. When you're done, click Start survey. Surveys are sent after the target list is processed and filtered. This might take a few minutes to several hours (up to 24 hours for a large list). You'll receive an email when surveys are sent. The live survey remains open until you manually close it (see Closing an NPS survey). You can add users to the live survey (see Inviting more recipients to a live NPS survey). Surveys are sent from your default support address (see Setting a default support address) unless you are using a custom email domain (see Sending your survey from a custom email domain). Surveys are sent in the default language, unless the survey is sent to an existing user who has another language set on their profile or you specify the user's language in the CSV file (see Sending your survey in the user's language). For a comprehensive list of customizable elements, see Customizing your NPS survey. You can customize both the survey email and confirmation panes. In the Customize Survey section of the survey page, click Email. Click the From email address to select the brand you want to use. Click the Subject line to edit it. Click Add logo file to browse for and upload a logo image; or, drag an image into the logo upload area. Click the Intro text (which defaults to "How did we do?") to edit it. You can use dynamic content in this question. If you are sending your NPS survey in multiple languages, insert a dynamic content placeholder here so the question appears in the correct language for your users (see Providing multiple language support with dynamic content). Click the Organization name in the survey box to edit it. Click the Audience type in the survey box to select from available options. Click the Highlight color picker to select a color for the rating numbers, and the Send feedback button on the confirmation page. At the top of the Customize Survey section, click Confirmation Page to review the confirmation page users see after they select a rating in the survey. Click the Follow-up question (which defaults to "Will you share why?") to edit it. NPS surveys are delivered by a third-party vendor, Mandrill. If your default support address is a Zendesk Support email address (see Using variations of your Zendesk Support email address for support requests), your NPS surveys will be sent from that address. If your default support address is your own custom email domain (see Forwarding incoming email to Zendesk Support and Setting up SPF for Zendesk to send email on behalf of you email domain), your NPS surveys will be sent from a Mandrill email domain. You can take steps to send your NPS surveys from your custom email domain. To complete the set up, see How do I add DNS records for my sending domains on the Mandrill website. You can send the NPS survey in any of the Zendesk supported languages. See Language codes for Zendesk supported languages for a complete list. Default language is set by clicking the Admin icon ( ) in the sidebar, then selecting Settings > Account > Localization. If you send a survey to a customer who is an existing user, the survey will be sent in the language set on the customer's user profile. If you send a survey to a customer who is not an existing user, you can specify the language code in a CSV file, and the survey will be sent in that language. Languages you include in the file must be enabled (see Adding multiple languages to Zendesk Support). If you send a survey to a customer who is not an existing user, and you do not specify the language code for the customer, the survey will be sent in your default language. Like the Intro text, you can insert a dynamic content placeholder so the survey appears in the correct language for your users (see Providing multiple language support with dynamic content). When you're done creating and customizing the survey email and confirmation page, you can send a test survey to up to 10 recipients. The results captured from this test are not included in your survey score. At the top of the survey page, click Test survey. Enter up to 10 recipients and an optional message for the test email. 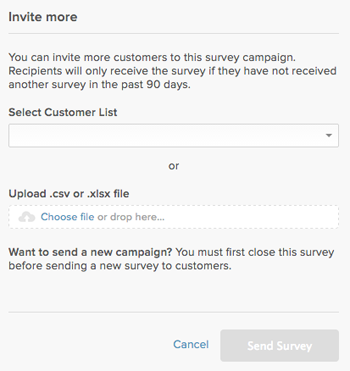 You can invite more users to a live survey campaign at any time. You might want to invite more users to an existing, live survey so you can consolidate all their NPS responses into one data set for analysis. When you start a survey campaign, you can invite a maximum number of 10,000 customers. You can invite more customers to the survey later, after you send it. You can send as many invitations as you want, but each invite has a limit of 10,000 recipients. Select a customer list or upload a CSV or an Excel file. Remember, the maximum number of customers you can invite to a live survey at one time is 10,000. You can send as many invitations as you want, but each time you invite users, there is a limit of 10,000 recipients. You can check for results at any time after you send the survey. Remember, surveys are not sent immediately after you finish creating the survey. It might take several hours to process the target customers list and send the surveys. Email confirmation that surveys have been sent to customers. Email reminder one week after surveys are sent so that you can check results. Email notification when your NPS survey closes, so that you can see the final score and plan your next survey. For information about checking for results and next steps, see Analyzing your NPS survey results. You can have only one live survey at a time. A survey remains open to collect feedback until you manually close it. You must close a live survey, if there is one, before you can send a new survey. Click Close survey to confirm that you want to close the survey. Your survey is closed and cannot be reopened. Will the ability to send out more than one NPS Survey at a time change any time soon? We would love to send out multiple campaigns tied to each of our brands. I want to make sure your NPS survey capabilities match my needs. I want to send all current customers an NPS survey right off the bat, first of all. Thereafter, every 90 days. Additionally, I would like to survey each new user 14 days after they purchase our product, and thereafter every 90 days. What is the most seamless way I can do this continuously as new users come on? We don't have any methods to automate the sending of NPS surveys, so if you're wanting to send those out every 90 days and 14 days after they purchase your product, those functions will need to be tracked and applied by you manually. You can use customer lists to see and group all users, or those who have been added to the account within a set time frame, but there isn't anything inherently available to see how long since they make a purchase with your product. You could add a tag to the customers once they buy the product and sort them into a customer list using that tag, but you'd need to remove the tag manually after the 14 day period is up. @David, I can't provide a timeline, but multiple parallel NPS surveys is in our plans for NPS. One thing to highlight is that if you're using our multibrand feature set, we probably won't initially release with full integration into brands, since the brand attribute only exists on tickets right now, not users, and you would not be able to segment your users by a brand. @Amann, to add to Justin's response, we do have an NPS API that you could use to automate NPS surveys through our system if you're able to integrate your system with our API. See our developer docs at https://developer.zendesk.com/rest_api/docs/nps-api/introduction for more information. This survey is incredibly intuitive and provides great results. One enhancement that would be great is to have the Follow-up content based on what ranking the customer gave. i.e. if a customer clicks 10 he/she sees "Why do you love us"
i.e. if a customer clicks 1 he/she sees "Why do you hate us"
Could this be done sometime in the future/ should I post this somewhere else? Hi Alex, we've received a few requests similar to this, but we would want to then start to think about how we provide more customizability for our surveys overall. For this particular use case, could you instead ask "Can you provide a reason why you gave us that rating?" which covers both use cases? That's a good point! Nevertheless, it is still nice for the customers to get a more specific question rather than the generic questions. But yes, your question could be a nice workaround! Also one more question. The article below says that you can only send out an NPS survey to an individual every six months, but this newer article it says 90 days. I just want to confirm it is 90 days so I can plan for future campaigns. Alex, we recommend six months for a canonical NPS survey as a best practice, but the product does offer more flexibility than this. We limit this in the system to every 90 days right now. I downloaded the template for the custom list and filled in my names and emails as needed. It keeps telling me my list is not properly formatted?? A while back you mentioned multiple parallel NPS surveys as a feature you were pursuing, what is the status on this? We operate multiple brands and being able to time NPS surveys serially seems to be the best way to go about it for comparable purposes, but it doesn't seem possible at the moment. I was able to generate a daily NPS report status and receive it daily for the on-going survey. Can you let us know how to set this up? Jacob: we don't have plans to add multiple parallel NPS surveys to the existing NPS feature set within the Support product. After evaluating adoption of NPS, and also the targeted nature by which many of our customers would like to deliver their NPS surveys, we believe our Connect product, which is currently in early access, is the right home for NPS moving forward. We don't yet have a timeline for when this will happen. Dominique: We don't have any trigger-based capability that lets you notify yourself of when an NPS survey with score < 9 is detected. Is the ability to integrate the NPS survey results into Salesforce in the roadmap? It's nice to have NPS in Zendesk, however, it provides so much more value when it is combined with other user data. Hi Will, we don't support data sync from Zendesk back to Salesforce natively, though this could be done via our API. We are also working on our new analytics platform, Explore, which will allow you to combine Zendesk data (including NPS results) with other external data sources, such as Salesforce. I see that Placeholders can be used in some areas of the survey but not in the Subject line. Is that correct? If so, is this something Zendesk is looking into for the future? Hi Alex, that's correct, the placeholders are only supported in the survey follow-up page and not in the subject. Moving forward, I agree this should be supported in the survey subject as well, but I can't offer a timeline for when this will be implemented. Is there a way to send the survey to customers who haven't responded rather than simply a reminder and them having to find the previous survey? Hi Angel, there's no way to currently do this in the product. As I responded to on this community post, we think it's a good idea but don't have any plans to make additional enhancements to NPS at this time. Hi I was trying to find an answer for this: I sent an NPS by mistake to a list I imported as a CSV and closed it less than a minute after. Is there a way to recover from that to reuse the customer list? I keep getting the error that the users are not allowed to be sent the NPS again. The system is a little clunky. I would have loved to have a way to rename the campaign before taking this action. I didn't know this was going to be the result. Sorry for the delayed response here! I see that you have a ticket open about this with our Support Team, so we'll take care of you there. Feel free to come back and share the resolution with us when everything's all sorted out! Thanks, Heather. I've alerted our documentation team to correct it. We are stoked to inform you that the first version of our Loyalty Radar app is out and available for installation in your Zendesk as a private app. You can download it from this article. Before you proceed to the installation, we recommend to take a look at a couple of other articles that we created to guide you through the installation and setup processes. When uploading a CSV to define recipients, can I include extra fields (external_id, custom_fields.<field_key>, etc.) and have these user fields imported correctly? Or, should I import these users first through the bulk import user tool and then create the NPS recipient list? User creation/update is a separate function from creating an NPS recipient list, so you'll want to do a bulk user import first and then create the list. It says you can only send 10,000 at a time, we have 24,000 customers. How do we know who has received the invites and who has not without having to check through all the names?! "End-users do not have to be logged in to rate their tickets"
Our users has to be loged in to leave a rating, and therefore we are not getting a lot of them. The same login page that are used in the HC are the one that´s showing. How do I change this, what setting is it? Your quote appear to be from this article about using Customer Satisfaction (CSAT),it sounds like that's what you're interested in? CSAT surveys are used to measure the customer satisfaction in relation to a ticket the reviewer has had with you. CSAT surveys are usually sent out by email after a ticket has been solved, and there should be no requirement to be logged in to the HC in order to answer them. This article, however, is about NPS surveys, so if I've misunderstood you completely I'm sorry. I don't believe the NPS survey should require a login either, could you show by screenshot what you're seeing? Oh, Im so sorry I hade both of the articles up in tabs. Yes, it's the CSAT that are sent after solved tickets. I think it can have to do with the device the customer is using. It works in incognito for me but not for my other agents. I have reacted on how few responses we´ve been geting. Here comes screenshoots from the mail and the page that comes up after pressing the link . I could see the yellow branding on top for a second or two, showing that it links to the mobile view of our zendesk, so it's like its redercting directly to our zendeskdomain.